The Speak and Spell is a handheld electronic device and educational toy with a very interesting place in history. The toy/learning aid was developed in the late 1970s by Texas Instruments and introduced to the public at the Summer Consumer Electronics Show in June 1978. Its claim to fame is that the Speak and Spell was the first commercial product to use a brand new technology, called DSP technology. "the Speak and Spell digital signal processing (DSP) innovation in audio processing is the starting milestone for the huge digital signal processing industry that has a more than $20 Billion market today. Using digital signal processing has grown tremendously with the development of analog to digital and digital to analog conversion chips and techniques. Digital signal processors are used in many of the consumer, industrial, and military applications." By definition, DSP (short for digital signal processing) is the manipulation of analog information into digital. In Speak and Spell's case, it was analog "sound" information that was converted into a digital form. 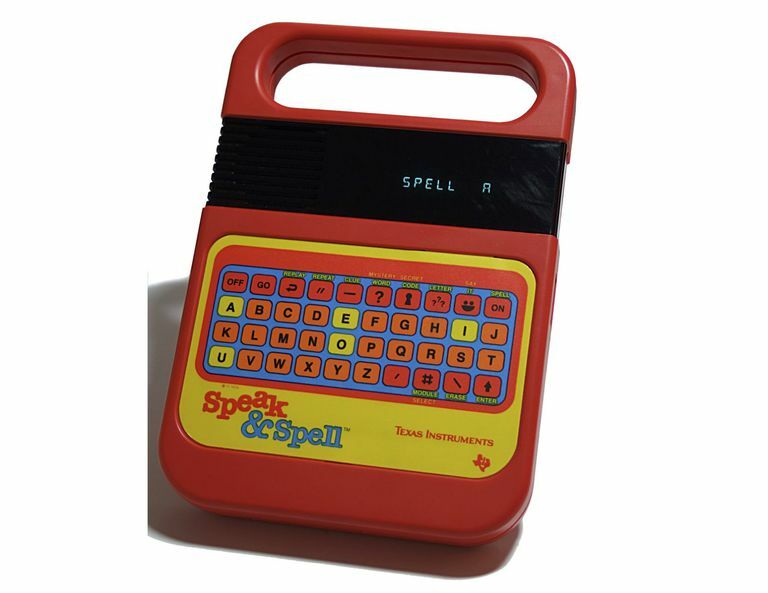 The Speak and Spell was a product that was the result of Texas Instruments research into the area of synthetic speech. By being able to "speak" to children, the Speak and Spell was able to teach both the correct spelling and pronunciation of a word. The Speak and Spell marked the first time the human vocal tract had been electronically duplicated on a single chip of silicon. According to the manufacturers of the Speak and Spell, Texas Instruments, research on the Speak and Spell began in 1976 as a three-month feasibility study with a $25,000 budget. Four men worked on the project in its early stages: Paul Breedlove, Richard Wiggins, Larry Brantingham, and Gene Frantz. The idea for the Speak and Spell originated with engineer Paul Breedlove. Breedlove had been thinking about potential products that could use the capabilities of the new bubble memory (another Texas Instrument research project) when he came up with the idea for the Speak and Spell, originally named The Spelling Bee. With technology being what it was at that time period, speech data required a challenging amount of memory, and Texas Instruments agreed with Breedlove that something like the Speak and Spell could be a good application to develop. Paul Breedlove originated the idea of a learning aid for spelling. Gene Frantz was responsible for the overall product design: spelling words, case design, display, and operation. Larry Brantingham was the integrated circuit designer. Richard Wiggins wrote the voice processing algorithms. The Speak and Spell was a revolutionary invention. According to Texas Instruments, it used an entirely new concept in speech recognition and unlike tape recorders and pull-string photograph records used in many speaking toys at the time, the solid-state speech circuitry it used had no moving parts. When it was told to say something it drew a word from memory, processed it through an integrated circuit model of a human vocal tract and then spoke electronically. Made specifically for the Speak and Spell, the Speak and Spell four created the first linear predictive coding digital signal processor integrated circuit, the TMS5100. In layman's terms, the TMS5100 chip was the first speech synthesizer IC ever made.